I’m sorry to say I don’t remember the exact year of this trip, but once again we went to Bologna for the two scientists to collaborate. However, this time a third scientist was added to the mix. When my husband A was a post doctoral fellow at University College, London, he became very good friends with another post doc, Thiru, a Tamil from Sri Lanka, who later became a faculty member at U.C.L. So Thiru, a theoretical chemist, was invited to come from London to Bologna to consult on the research. We three stayed at the usual hotel and every day they went to CNR, while I entertained myself. Grazia was the administrator in Carlo’s lab but she took a holiday day this visit and we took the train to visit Faenza, a town famous for its particular type of hand painted ceramics. 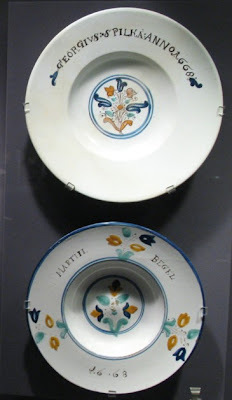 Although the town has given its name to faïence it’s known as majolica in Italy, since the technique originated in Majorca. Complicated, no? 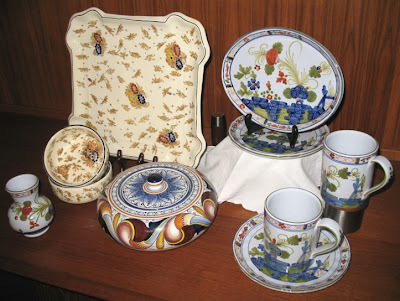 Grazia owned dinnerware from Faenza and she wanted to add some pieces to the set and knew that she could find them in the co-op guild store there. 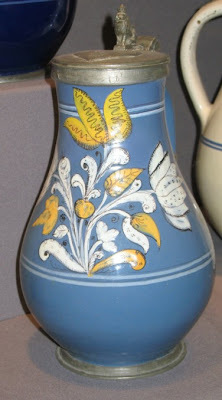 As with every town in Italy, the pottery patterns are very distinctive for the region and her pattern is called garofano which is Italian for carnation. It’s not cheap, because it is all hand painted, but of course, I had to have some too. I bought two mugs, two large bread and butter plates and a small, oval cake plate, which you can see above. 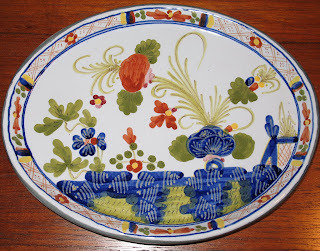 When my daughter was married, in 1996, Grazia bought her a beautiful decorative wall plate which had two hands entwined, from Faenza. She said it was a plate designed especially as a wedding present. While we were there, we also visited the International Ceramic Museum, which is a wonderful museum for all pottery, but especially Italian ceramics. This is a huge collection, with galleries devoted to the history of ceramics, works from the Italian Renaissance, from the Classical era and from other parts of the world. 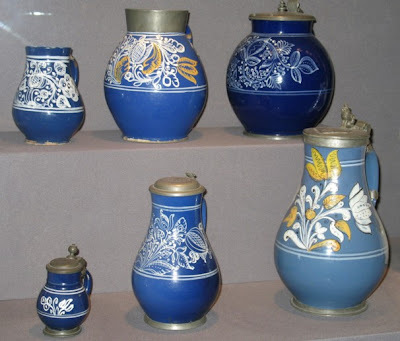 Many modern artists have designed pottery and there is a contemporary gallery with lovely pieces designed by Chagall, Picasso, Matisse and other well known artists. After the scientific work was completed, the three of us set off for Florence for a week, for our first visit there. On the recommendation of a friend in Vancouver, we stayed outside of Florence, near the hill town of Fiesole, at the Pensione Bencista Hotel. This villa was built in the 16th century and is a lovely building, set in a vineyard, with large rooms and public areas, and furnished with beautiful antiques. A stay there included breakfast and dinner, so we took breakfast on a wonderful terrace, which had a breathtaking view of the whole of Florence, while dinner was eaten in a large dining room, at a set time for all guests. 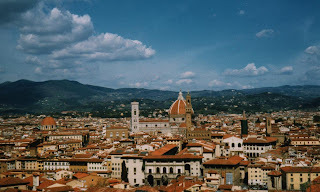 Each day we took the public bus into Florence, down the winding road and into the centre of town, stopping at the Piazza del Duomo, the square in front of the Duomo, as the Cathedral is known. This is the Italian word for dome and so famous is this great engineering feat that it gave its name to the Cathedral of Santa Maria del Fiore. This is the heart of the city, always filled with tourists, no matter what the season. The Cathedral, dominated by the magnificent dome of Brunelleschi, stands next to the Campanile, the bell tower, designed and begun by Giotto. At the time of our visit, they had begun the cleaning of the multicoloured facade of the cathedral, but I did not see it in all its glory until a later visit to Florence. Facing the Duomo is the famous Battistero or Baptistry, with its splendid doors. There are three of them, two by Lorenzo Ghiberti, the third by Andrea Pisani. The interior was badly damaged by the flood in 1966 and you can see the demarcation line of the water high up on the walls. What can I say about Florence that hasn’t already been said by so many. It is the centre of the Renaissance, which took place under the Medici who became the dominant family in that era. The buildings, the art work in the various museums in the city, the churches, all make this the perfect city for the visitor with an interest in the period. In fact, if you don’t have an interest before you come, you will certainly have developed one by the time you leave. The city abounds with the works of Michelangelo, Donatello, Giotto and so many others. I have been to Florence three times for a total of four weeks and have never exhausted its treasures. As we wandered about the city, visiting the various sites, we formed a little triangle, with me in the front, forging on, looking for the next interesting thing to see, with the back half being the two men, not taking a bit of notice, ambling on, talking non stop about things scientific. On one occasion I went into a store to look at reproductions of antique maps, with an eye to buying one for my son. They waited outside, talking, while I darted back and forth trying to solicit an opinion. I finally bought one and we framed it on our return and more than twenty years later it hangs in my son’s house over his mantelpiece, so I did choose wisely. Of course we did go to the Uffizi, the Accademia, the Ponte Vecchio and the Pitti Palace with the Boboli Gardens, but I won’t bore you with the details. We also went up to Fiesole to look around and found a beautiful first century AD roman theatre where they were doing the preparatory work for the staging of a play. We sat in the terraced stone seats and watched and enjoyed the view of the surrounding hills. The next time we came to Italy was 1984, when we introduced our 17 year old daughter to its charms, not knowing that 12 years later, she would marry an Italian.